If Harley is a household name in the US, the Scandinavian equivalent is Nimbus. The Danish brand is familiar to people who have never even thrown a leg over a motorcycle; created by vacuum cleaner manufacturer Fisker & Nielsen, it became the chosen transport for the Danish army, postal service and police. 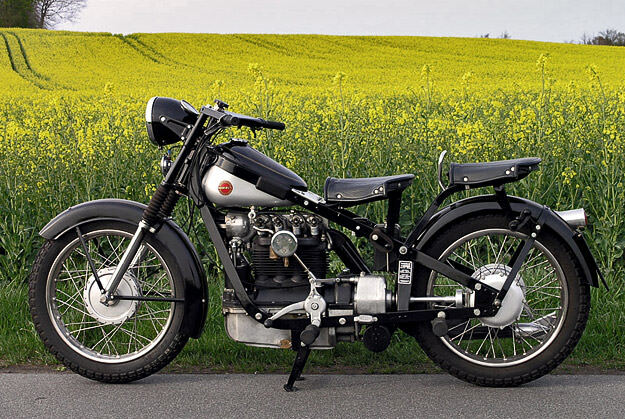 The best-known Nimbus variant is the Model C, built between 1934 and 1960—although only a trickle of machines left the Copenhagen factory during the War years. The Nimbus boasted advanced technology for its era, using shaft drive, a 746 cc OHC engine of 22 hp, and a frame fashioned from steel strips riveted together. Half a century later, parts are still readily available for the Humlebien (“Bumblebee’), and the machine has a reputation for being an economical and reliable daily driver. Many restored examples are still on the road—and a couple are even circumnavigating the world in the hands of intrepid explorers. This particular machine is a 1957 model beautifully restored by Søren Grønbech, and it’s got to be one of the finest examples of a Nimbus Model C in creation. Check Søren’s website for detailed photos of the meticulous rebuild.